Shona ODonnell of iGB invites the gambling industry for this years’ London Baby Party on the 5th of February at the Hippodrome Casino. SBC, has joined forces with iGB, to bring the online gambling industry an event on the Tuesday evening of ICE Totally Gaming in London. Will the real Michael Caselli please stand up? ICE ICE Baby Party Review: Word to your mutha! 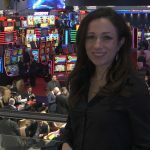 CalvinAyre.com Reporter Becky Liggero provides the details of the ICE Totally Gaming Opening night party, Ice Ice Baby at Opal Bar.